So much yarn, so little time. : Meerkats and Flutterbutts like to party! It was nearly time for Tzipi to move on to her next host Nathalie and of course it's results night for Harry Hill Meerkat, we decided it was definitely time to party! Tzipi was thrilled when she discovered another flutterbutt guest, and was pleased to meet some more new friends: Mermaid, Froglet and TinyTweet. 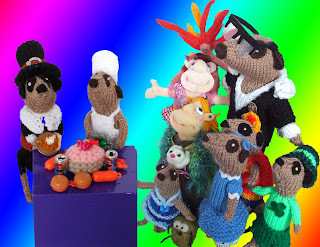 Chef Meerkat had prepared a feast with the help of our good friend PaisleyChainsaw, ably assisted by the Pilgrim Father who discovered hidden talents as a waiter. Soon though, it was time to settle down in front of the TV to watch Harry Hill's TV Burp. 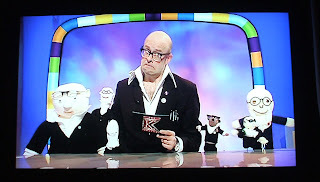 It was time to discover whether Harry Hill Meerkat had been voted through to the not-live finals of the K Factor! ...and then they all watched the show. The meerkat mob completely forgot their manners, so it was a good thing Tzipi was still on her box! So who will go through? 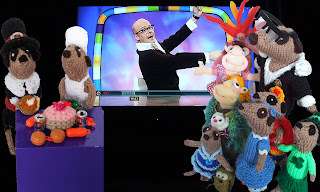 Which knitted Harry Hill is going to the not-live final? Congratulations! And I hope they helped you clear up in the morning. WOOOOOT! Many congrats to Harry Hill Meerkat! Sitting here with my son reading through your post when I said to him , "Hey, you can buy your very own Harry Meercat". " Realyy!!!" says he so loud in my ear I actually flinched, then I told him how much and he's away to count his twos and ones....aaawwwww. Oh bless - I'm working on some smaller ones now, but they won't be able to have so much detail of course. You´re dealing with an Icon now, Nifty!! Congratulations with all my heart!! YAY!!!! So happy for you! thank you all - and as clarebears rightly says, well done twitter etsy facebook blogger and folksy! Yeah! Congratulations! Super excited for you! Whoo Hooo and a burpity buuupp burp burp burrah! bit slow off the mark but whooooooop!! Folksy and Etsy have some serious voting power! We can change the world one meerkat at a time. I am doing really badly at leaving a message, my computer keeps deleting my message! Sorry! Conratulations! Good luck for the final! Yeah Heather!!!!! 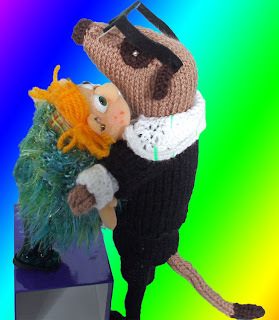 I'm so excited for you and Harry Hill Meerkat! This just rocks! Yay! Great job Heather! Good for you :) Big congrats to you and little HH! Valentinefibrearts I'm so sorry to have removed your comment by mistake - I was intending to remove dotties' surplus to requirements ones that she'd already deleted, but my mouse hand slipped! I saw your meerkat on harry hills tv burp last night and rewound the telly with sky plus to show my boyfriend and said i know the lady that made him!! hehe, just been showing him your blog. watched harry hill just to see meerkat win and he did...!!!! the whole street must have heard the cheer from our house. Yay Heather! Congratulations! Your hands are going to be getting plenty of knitting exercise. 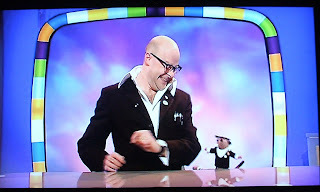 (I confess I have never heard of Harry Hill before, but obviously plenty of people have.) Best to you for all good things! Brilliant! Of course, we all knew you had the K-Factor anyway.. but best of luck and can't wait for the not-live final! Fantastic news, Heather - many, many congratulations! It was only a matter of time before your meerkats took over the world! Congrats on a wonderfully exciting win for you!! I'm so very happy for you and can't wait for the news that you've won the whole thing, yay! Yay!! big cheers from our house too!